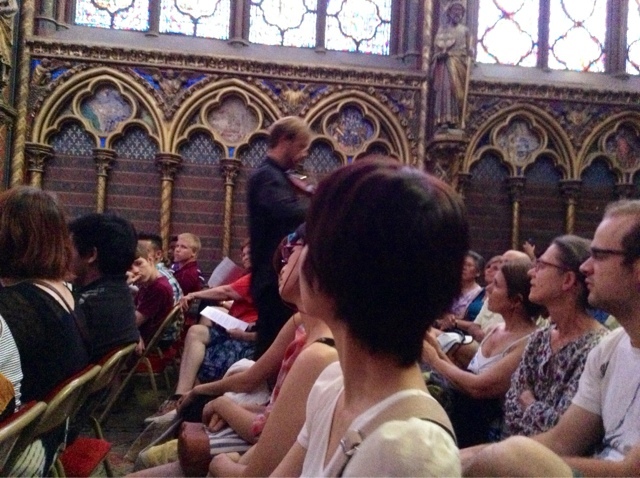 Thank you Cyndy, Sukicart, Jeanie, Ann, Judith for reminding me of the evening concert series at la SAINTE CHAPELLE. 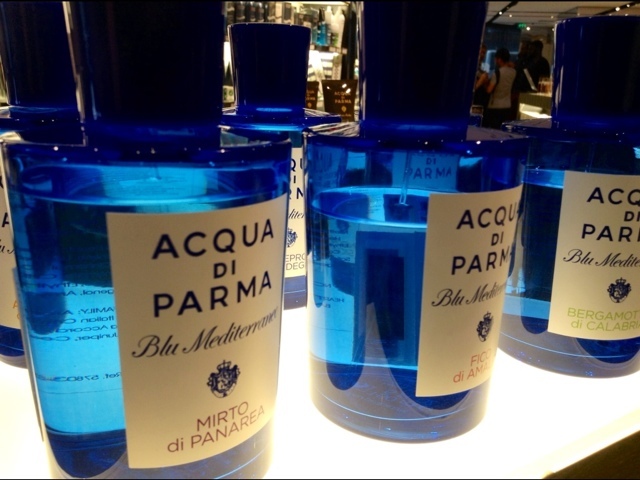 Tickets can be bought at a ticket counter in Galeries Lafayette men's department as well as at FNAC and other venues. This men's cologne looks a lot like stained glass or am I seeing things? You enter the chapel through the portico, not the tiny winding stairs but it's still a knock-your-socks-off experience! I bought the cheapest seat (27,50€). No reserved, numbered seats but still just fine as far as acoustics and visibility go. 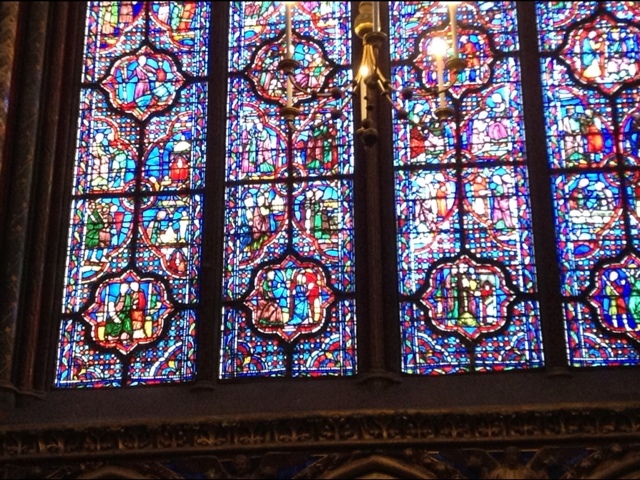 The main thing is to have the time to really LOOK at the stained glass windows leisurely. Instead of the mad, pressured blur when you visit during the daytime. It doesn't hurt a bit to have Vivaldi playing in the background. I saw so much more of the variety of colors and patterns last night I'd missed on my first visit. 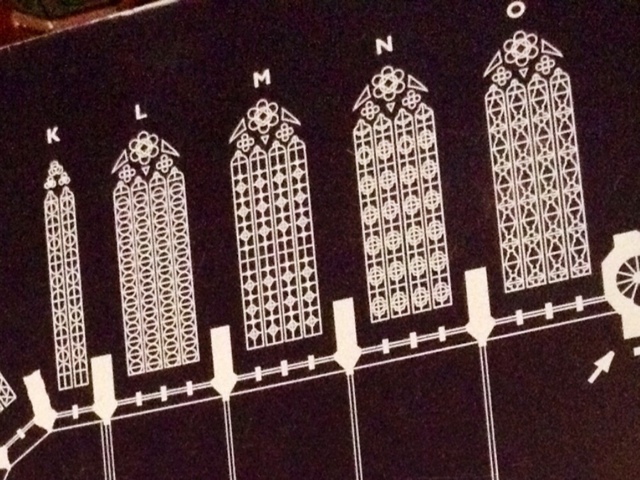 Look for a small diagram near the portico door. I'd wished I read more before visiting and of course my only ballpoint pen gave out so no sketching. 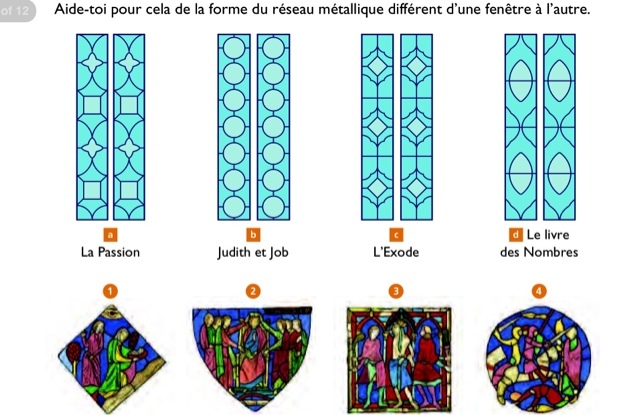 The PARIS MONUMENTS site has a 12-page PDF meant for kids (in French) but still interesting for a bit of visual orientation before you visit. Patterning accents of reds, blues, greens and yellows are surprisingly abstract. 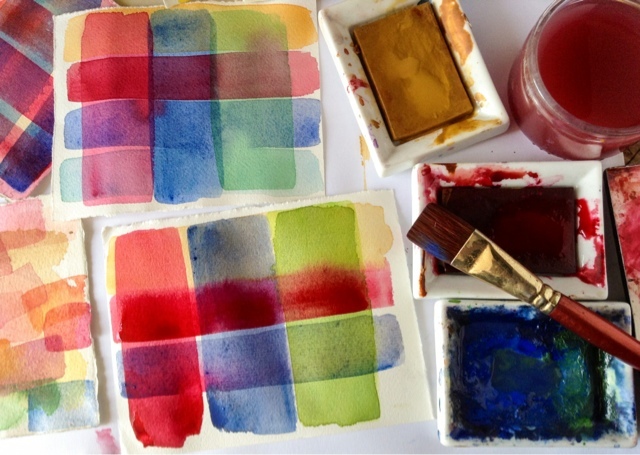 Here's a mini DIY watercolor demo on making glazes. 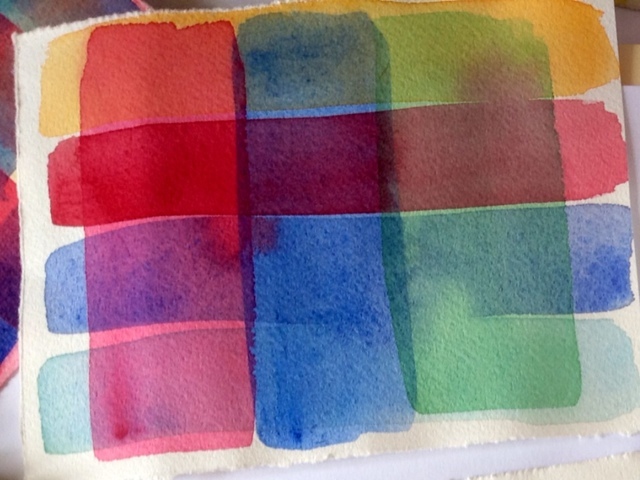 I used Windsor and Newton watercolors: Yellow Ochre, Alizarin Crimson, Cobalt blue, Cerulean and a mix of bluish greens (transparent colors). 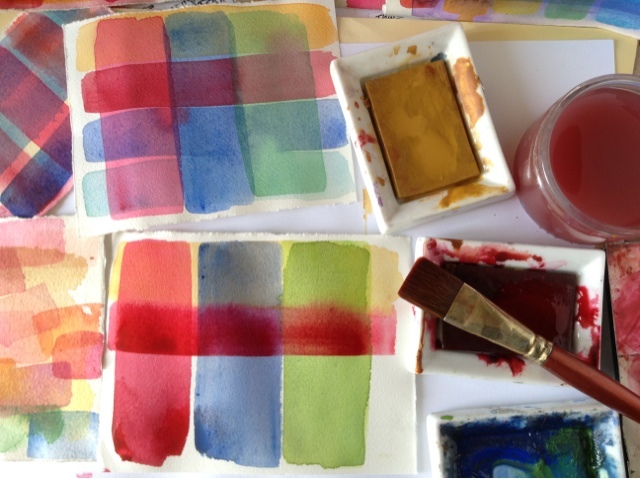 This is where you have to "watch paint dry" before adding the next overlayed swatch of color. My flat brush is a 2" synthetic. A good trick - tilt the paper slightly looking for shiny areas. You can also touch it lightly with the side of your hand...just a quick bounce to feel for dampness. 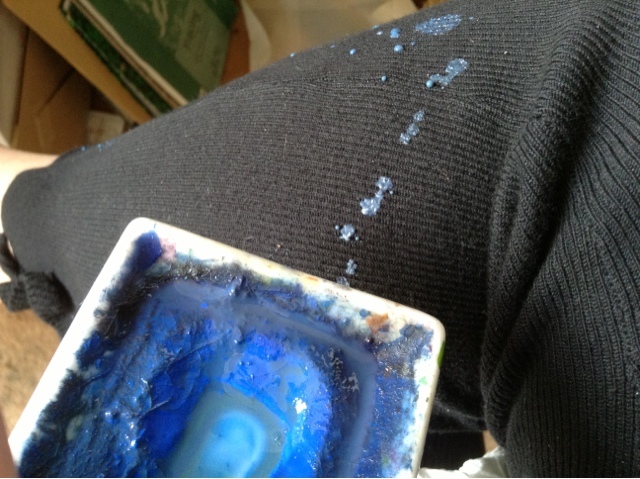 Do Not spill wet paint on your leg or lap. You'd think I'd be more experienced at these things...ahem. When this is done right, the colors combine creating new colors. 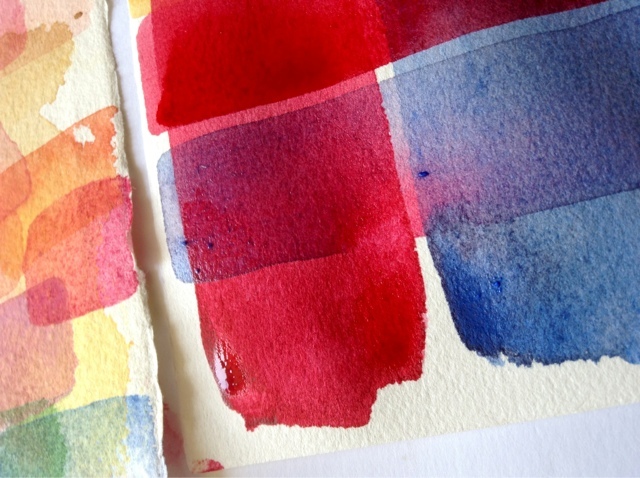 The white paper acts like the light behind the stained glass windows, illuminating the layered colors, giving an added brilliance (why you have to keep the washes transparent and thin). *You can still get a stained glass watercolor by subscribing or renewing the Letters on Etsy, dear PBers. Tomorrow I'm off to relook Chartres. More stained glass and Medieval times to come. All in favor say Yay or Nay. I went to a concert in a Barcelona chapel last autumn. Guitar ! I loved it and bought the CD of course. 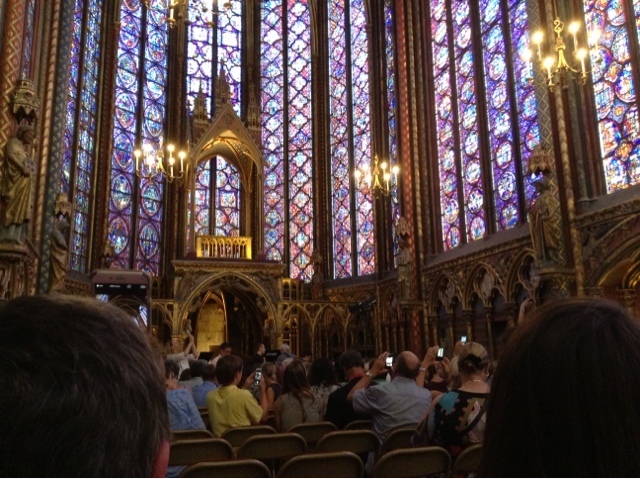 I would have loved this concert in the Sainte-Chapelle as well ! 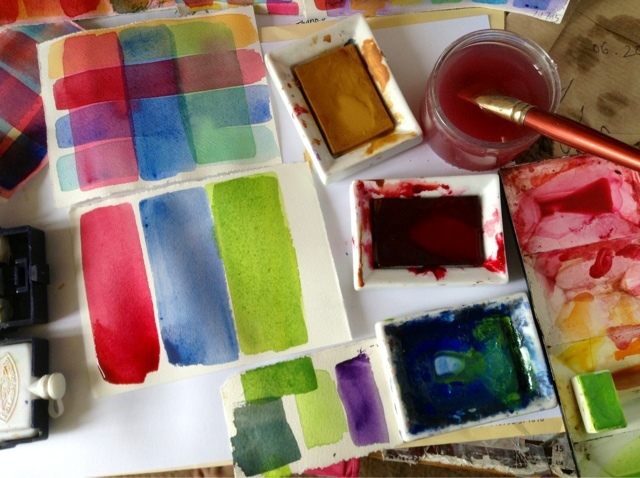 I will try your mini DIY since I bought a set of aquarelle paint this summer and barely used it ! It is raining today, so why not ! 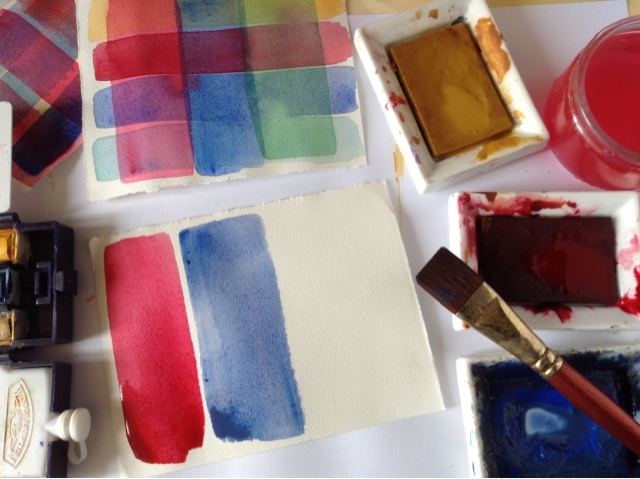 Just use red, yellow, blue, green in thin watery washes...not too opaque. 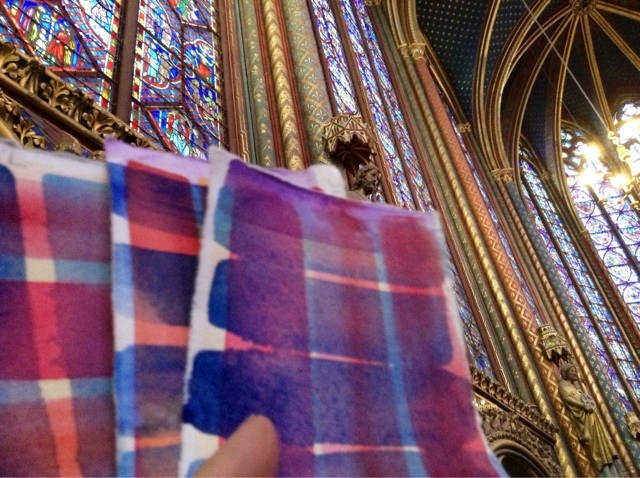 Carol, those Sainte Chapelle windows are truly dazzling...and your watercolor washes definitely sing the same tunes. I also find the window's geometric mix of colors remind me of fair isle knitting, which is currently fascinating me. I love the line drawings of the windows graphic design. Bear stayed home and the watercolor swatches got to go? I loved going to church ... in awe of all the stained glass..Of course Rome..was the highlight..
your color washes are beautiful. If you were to buy Pyrrol Orange..would you get transparent or not? Pyrrol Orange is supposed to be opaque but with enough added water you can dilute any color and get thin transparent washes. More important is what's beside it and under or over. I will get the non transparent then..I look forward to weaving. 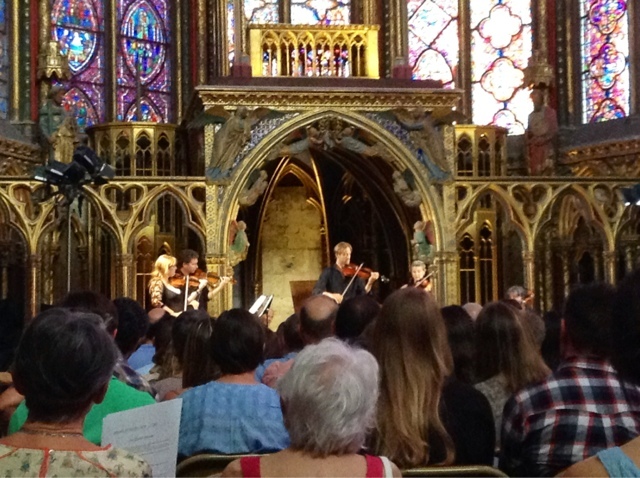 I love going to Sainte Chappelle and visit every time I am in Paris, even better if they are having a concert! Enjoy Chartres and your painting. IT brings joy to many. 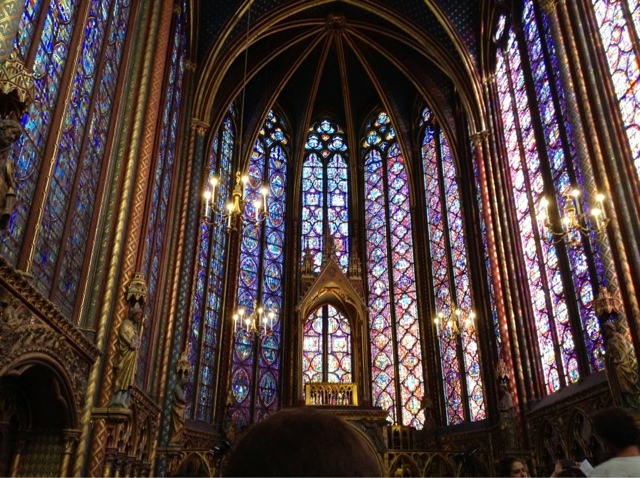 I love Sainte Chappelle and my husband and I have attended the Vivaldi concert several times...it is truly a Divine experience!!! Love the colors in this edition of PB! I can definitely see going back again. a whole hour inside the chapel! What an amazing experience! As for patience, if only I had waited for the paint to dry....oh, about a million times! I say, wear your paint spills with pride! You've earned them! Wear my paintspills like a Chanel jacket!! Carol, my emails to you at every address I have...keep getting rejected. For ages. I tried again just now. It's way weird. How/where does one contact you nowadays? Nothing urgent but it's weird to see. The other email was disconnected but the correct one is up above at Contact. We are going to Paris in November. When I saw the comment on your last post, I googled the concert schedule. Voila! We will have options for a concert! So doing this! Yay! Glad you went to the concert as I knew you would love it - how could one not love listening to music in that beautiful place. 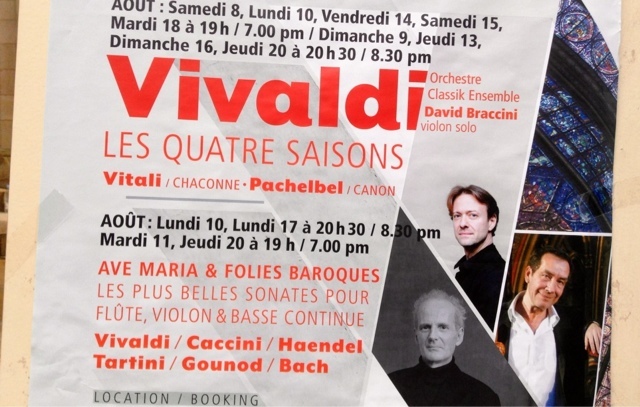 We went to a Vivaldi concert at St Chapelle 10 years ago and was lucky to have been seated in the second row. Watching the musicians have so much fun interacting while they played, greatly added to our enjoyment. It was one of my top experiences - ever! Two years ago we went again and were seated so far back we could not see the musicians. But, we could hear them AND study those gorgeous windows! If you go, get into line early. When we went the queue formed outside the Palace of Justice?, not at the entrance that you use when you visit during the day. It was fun to once again see one of your demos. 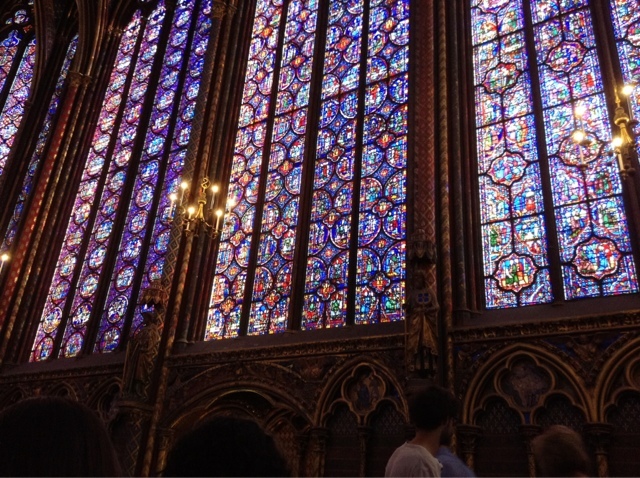 Yes, I was pretty awed by Sainte Chapelle, but during the day it was hard to just sit and focus, what with all the fellow tourists. Tons of touristes. I'd like to attend one of those concerts in order to be able to just sit and stare and maybe sketch. Liked the info from the Monuments site. There is very limited seating during the day. A different experience. Are you ever coming over Rita??? Amazing, Carol! I've always loved stained glass, and this church just pushes the limits :) I love your watercolor swatches, too; your little works of art. Quite a talented girl!